With PADI’s eLearning® option, and you can start learning right away through an interactive computer-based program. Or if you prefer, tap into the PADI Touch™, a tablet-based application with no internet connectivity required. 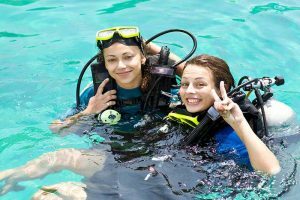 Both options integrate the PADI Open Water Diver manual curriculum, learning objectives, video clips, quizzes and Knowledge Reviews and exam into a rich, interactive learning environment. The theory learned gives you the background information you need to dive safely and allows you to study at your own pace. Once on-island, you will meet with your instructor to complete your confined water skills sessions and open water dives on our lively house reef. Day One: You will meet with one of our PADI instructors to review your course paperwork and review what you learned online. Immidiately following begin the Confined Water training sessions. During these practice session, which are conducted in the shallow water immediately in front of the dive center, you will learn how to set up and adjust your equipment, practice skills and learn safety procedures. Not Included: PADI eLearning course are not included in the registration price.